Invisalign is a clear and invisible brace system which enables patients to get the smile of their dreams without anyone else even knowing they are wearing braces. It is the perfect treatment for people who are worried about undergoing orthodontic treatment and having to wear metal braces. Unlike traditional braces, Invisalign uses a series of removable aligners to straighten teeth. The aligners are made from clear plastic and are virtually invisible to others. Treatment involves wearing each aligner for 1-2 weeks. The aligners are removable but should only be taken out when you eat, drink or brush your teeth. After 1-2 weeks the aligner is replaced with the next one in the series. This continues until treatment is finished and you are ready to show off your new smile. The aligners are custom-made using state of the art software, which plans the treatment process and anticipates results in advance. During the course of your treatment, you will be required to visit the dhealth Dentistry team every six to eight weeks. During these regular check-ups, we will perform any necessary adjustments and check on your progress. You’ll also be given your new sets of custom made, clear aligners. You will need to change these aligners every two weeks to keep gradually straightening your teeth; changing your aligners is the equivalent of having your braces tightened. 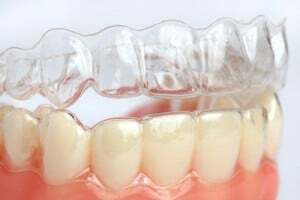 You should always keep in mind that there is no specific, set number of aligners; everyone’s teeth are different and therefore require a different treatment plan, and a different amount of alignment and straightening. With a treatment plan that uses Invisalign, you won’t have to worry about being embarrassed about having braces (which can be particularly traumatic if you’re an adult undergoing this type of treatment). Invisalign has been designed to be completely clear, and as invisible as is humanly possible. Generally, the only way people will know that you have Invisalign is if you tell them.